So I totally got (stole?) this idea from my friend Jess. We were on the phone talking about fall and coffee, fall flavored coffee, and how much we love all of that. You would probably be amazed by how often this comes up as a topic. We haven't seemed to exhaust this subject. We clearly are not adults, but children. Children who drink coffee. Incidentally, Max would like to be one of those. He loves swiping sips from my mug. I have learned to guard my mug more carefully. But just the other day Jess and I were talking about FAVORITE COLORS. We were having the same conversations that preschoolers have. I'm guessing tomorrow will bring some in-depth explorations on our favorite and least favorite animals. Jess was talking about how she loves getting pumpkin pie flavored coffee and stirring in cream and maple syrup. I was like oh my god, that might be one of the best things ever. So the next morning, I added some pumpkin pie spices to the coffee grounds before brewing as usual, and then stirred in a maple syrup mixture. It was... well... Fall, in coffee form. Pretty much the only way I can experience Fall here. But not longer! This Thursday, Seth, Max and I are heading back East, and we get to do all those awesomely cheesy festive autumn things - like pumpkin patches, and hay rides, and corn mazes, and apple orchards. Jess and I can drink this coffee - together! All while we talk about very important life subjects such as favorite colors and favorite animals. Mix all the spices together. Brew with your favorite coffee. I used 1 teaspoon of the spice mixture with a scant 1/2 cup of coffee grounds in my 8 cup french press. Whisk half and half, maple syrup, orange juice, vanilla extract, and salt in a bowl (or shake in a sealed jar). 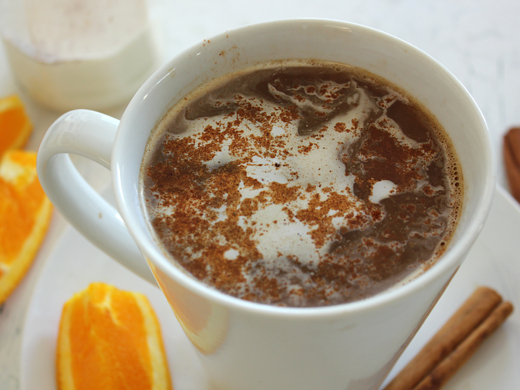 Pour desired amount into the spiced coffee, serve with cinnamon sticks and orange wedges. I'd love to have a mug of this! What a great idea! I love this; I'm sure your friend doesn't mind your 'stealing'! Oh, this is fall in coffee form! I love the sound of the maple syrup cream! This is brilliant! I'm seriously going to make another pot of coffee, just so I can try it. :-) Are you actually moving back east or just visiting? I'm not a coffee drinker but this seems like a really interesting twist on the original. Mmmm I can just smell this now!! Sounds so good! Delicious! Why spend money on flavored coffee when I can make my own? Thanks to you and your friend from where you stole the idea. Oh fall! And oh coffee! Especially deliciously flavored coffee. Thank you for sharing another tasty recipe and delightful post, my friend. I hope you have a wonderful week full of ample plates of good food! Love all these spices! Definitely fall. yummy! I love Autumn in any form and would LOVE to enjoy this with a coffee cake...lovely y'all! Thanks to your friend Jess, we will enjoy this one! Have a great trip to East. It must be a beautiful season to visit.. jealous! This is SUCH a wonderful idea! Love the US in fall, it's Spring where I am and it's great to be getting warmer but I will definitely miss all the winter dishes and drinks like this one! A fascinating seasonal treat. The spice mixture would be great for some X'mas baking too. This is such a great idea! My husband loves coffee and this one has all the right ingredients to be his favorite! Out East is where it's at, dude. And I see nothing wrong with having a conversation about colors. I got to study colors in my Perception class, and I wrote a paper about color for my Psycholinguistics class. It's a totally adult thing. Like this coffee. I don't normally like coffee, but this recipe has me totally tempted to make some. Dear Jenn, My daughter would love this coffee. I probably would too. I guess I am the "old fashioned" regular coffee type. I hope you have fun with the fall festivities. Can't wait until tomorrow morning to make this! Super yum. My Mom and I talk about the same things. Haha. Sounds totally unbelievable, must give it a try! Definitely more adventurous than my usual brew! This is definitely the best idea I've seen since the pumpkin spice latte was invented! Delicious! I am somewhat of a coffee purist, but my daughter has tried some sort of coffee/pumpkin drink and is absolutely obsessed with it. I'm going to have to forward this her way! And, well, I just might have to try some myself! Oh my gosh, I love this! So perfect for the season! Hi! I stopped by because I read your comment on Juanita's Cocina and I realized we have something in common... we love coffee! :) I have a Coffee Friday feature and link up party so hopefully you will join us tomorrow with this post! :) It's beautiful and would love to see it there! Great picture! My motto for fall is that if there's a pumpkin option, then I must try it! :-) This sounds super delicious!